Loot now, or loot later? 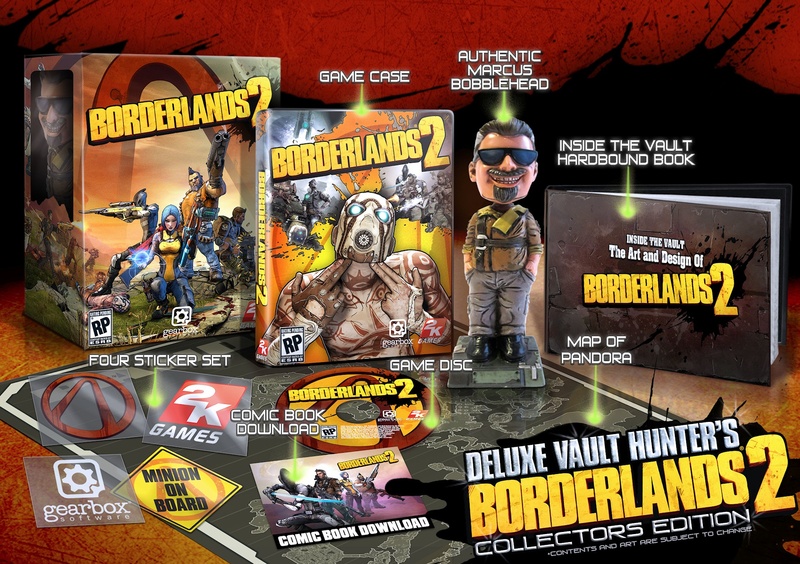 Have you seriously not pre-ordered Borderlands 2? What's wrong with you? Are you allergic to greatness? If so, I apologize. I hope you find a cure. You should probably stop reading this post. 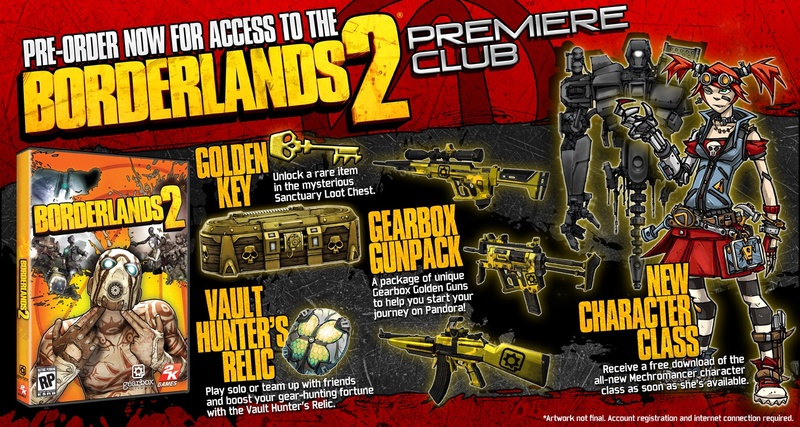 As for the rest of you savvy consumers, I'm sure you already know those of you who pre-order the looter shooter will be granted access to the Borderlands 2 Premiere Club. If features a host of goodies, including the upcoming Mechromancer class, custom Gearbox guns, and a mysterious Golden Key that will unlock the enigmatic Golden Sanctuary Loot Chest. ...the loot inside the Golden Chest is always of “very rare” (purple) quality and scaled to your character’s level at the moment you open the chest. Which means if you open the chest at level eight, you're going to get a level eight purple item. If you open it at level 40, you'll get a considerably more powerful level 40 purple item. Prepare to bask in all of its purpley glory! Of course, you might get a higher level item that puts it to shame in an hour or two. There's always something better . But hey, some people like to open their presents early. So... what are you going to do? Oh, did I mention that Golden Keys can only be used once? ...you cannot trade or sell Golden Keys, and once you’ve used a Key to open the Golden Chest, that Key is gone for good. I should note that there are other ways to obtain Golden Keys. Faylor mentions that they may be offered at special Gearbox events or giveaways. That sounds really cool. I just hope Golden Keys don't end up on the PlayStation Store or XBLA Marketplace. Paying for loot? Not this Vault Hunter. 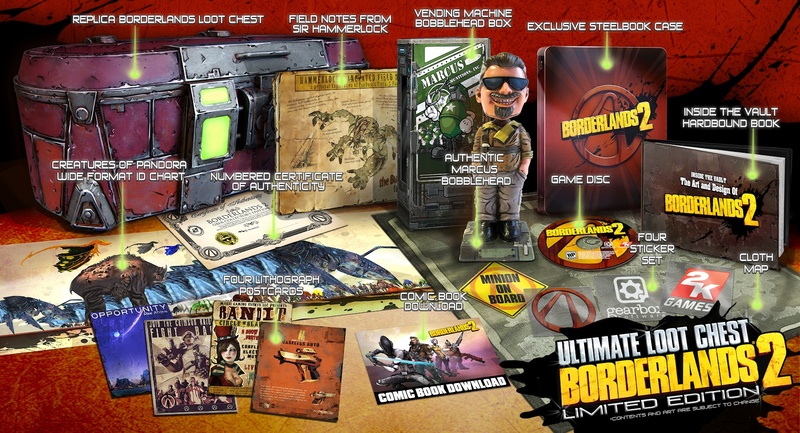 Borderlands 2 supports two player local co-op. Which means if you pre-ordered one copy, you'll be fighting over that Golden Key with your couch buddy. Get ready to duel! 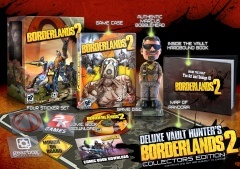 BL2 also supports four player online co-op and combo co-op. It will launch on September 18th for the Xbox 360, PlayStation 3, and PC. Page created in 0.3215 seconds.